Carrots are one of the easiest vegetables to grow in your garden, so they’re a great choice when you’re starting a vegetable patch. Children love watching them grow and pulling up the sweet roots when they’re ready for harvesting. Choose a sunny spot in your garden with well-draining, slightly sandy soil. Dig up the soil well and remove any hard stones or other particles from the soil, as they will damage the delicate carrot roots as they grow. Add a generous amount of well-rotted compost to the soil. Use a trowel to make 1cm deep furrows in the soil, spaced about 15cm apart. Sow the carrot seeds into the furrows. It helps to mix the carrot seeds with fine, sandy soil before sowing to ensure that you sow them finely enough. 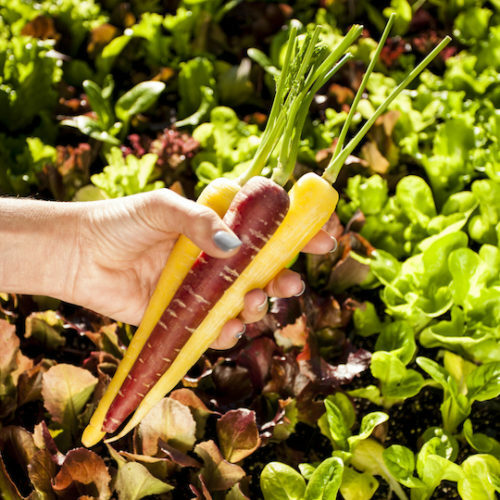 For a continuous supply of carrots, sow a new row every 3 to 4 weeks. Keep carrot fly at bay by sowing alternate rows of onion and carrot seeds next to each other. This will help to deter both carrot fly and onion fly. Did you know? Carrots as we know them today originated from the wild carrot, which is thought to be native to Afghanistan.